Formulaz, which shares only a word and the concept of driving four-wheel cars with its better known rival, kicked off on Sunday in the northern Turkish province of Rize's Ardeşen district. In the race, participants drive cars entirely made of wood, save for rubber and other materials covering the wooden wheels and apparently have more fun and less danger than the likes of Sebastian Vettel, winner of the latest Formula One Grand Prix in Hungary. While Vettel was able to clock up more than 300 kilometers per hour easily, drivers in the Turkish race barely made it faster than slow-walking onlookers who sometimes jumped onto the downhill course to help the drivers who were stuck due to a broken wheel. The race is sponsored by a certain energy drink brand that also sponsored the team that came second in the Formula One Grand Prix that Vettel's team beat. It is more in the vein of a local festival set against the backdrop of the beautiful scenery of the district surrounded by lush green hills. The "Laz" in the name refers to an ethnic group prevalent in the region. The race is held under the motto of "We Have Formulaz If We Don't Have Formula Anymore," referring to Turkey's brief stint as a host country for Formula One between 2005 and 2010. 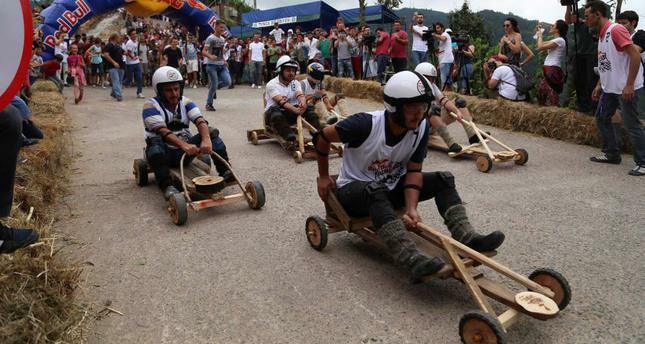 A total of 64 wooden cars built exclusively by the racers raced downhill in the 1,600 meter-long course. The racers whose wheels were broken were disqualified while some people were slightly injured when their cars overturned. Toprak Razgatlıoğlu, a motorcycle racer who won the European Superstock 600 championship, and professional rally driver Yiğit Timur were among the racers.